This rug can be made with no sewing or weaving involved. 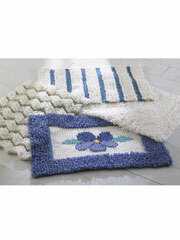 Choose what size of rug you want to make and then prepare your fabric to cut and braid. Use the tutorial on the Web site located here for pictures and step-by-step instructions. This will be a nice addition to your floor and can be made to match any room decor.